I had 26 comments on my giveaway post and 35 comments in the two weeks prior (excluding duplicate comments on one post and one comment I made). I had a little system for numbering the comments but I'm not going to bore you with it, just trust me ok? Freda--Congratulations! Please email me with your address (or give me your email address in the comments), Freda, so I can send you the charm pack! 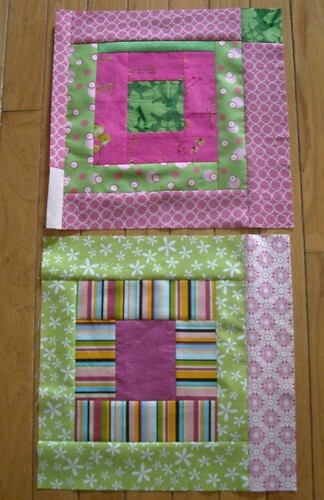 I had a couple other things--here are more quilt blocks for the KCMQG charity project. 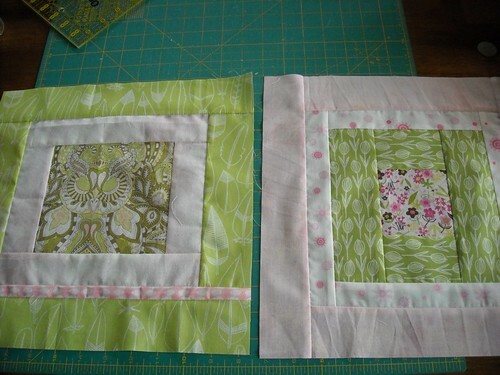 We needed some lighter pink and green blocks as well as some darker/brighter ones. Just a little status update on the project--not sure if I've explained what's going on for this project here yet. I have in my possession 10 finished baby quilts and 8 quilt tops that need to be quilted. There are at least 7 other quilts being made by guild members which means we will have a total of 25 baby quilts. They will be given to NICU families at the hospital where my daughter was born prematurely almost 2 years ago. The goal date for these is next month--I'd like to deliver them around Lauren's birthday. We have people lined up and waiting to quilt and bind the remaining quilts and I'm pretty sure we'll be done on time! I am so thankful for all the wonderful quilters in the Kansas City Modern Quilt Guild who have helped make this possible! I hope these quilts will give some comfort to families dealing with the challenges that can come from having an infant in the NICU. 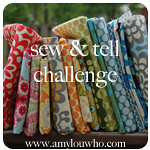 Also--Amy over at amylouwho.com is gearing up for a special Amy Butler Sew-n-Tell Challenge on September 24. 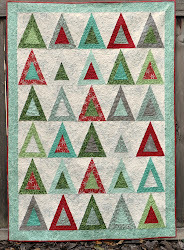 In a nutshell, you have until September 24 to finish a current project using Amy Butler fabrics or patterns, and the Sew-n-Tell link-up that day will be only for these Amy Butler projects. There will be prizes, too! Click here for more information. I have a kind of old UFO with some Amy Butler fabric in it, maybe I'll get it done in time for the challenge! thanks Vicki! I hope you finish it!